2006 Fashion Report | Bridal Style | Style Weekly - Richmond, VA local news, arts, and events. Other designs of note include fabulously short and chic cocktail dress-inspired gowns and delicious champagne pink colored dresses that are full of style and charm. Rounding out some of the year's more notable trends is the use of color (either as the actual color of the dress or for details) to create head-turning gowns. In addition to the palest of pinks and the lightest of lilacs, gowns graced with coral, green and blue hues will be popular choices for this year's spring weddings. Sophisticated caplets will be a must-have fashion accessory for many a winter bride. Other popular accessories for the year include shoes in varying heights (high heel, mid heel and pumps). Some brides still prefer the tradition of wearing shoes that are dyed to match their dress. Others are opting for those that are a shade darker than their gown or are the same color as a design detail in their dress. Crystal combs, jeweled clutches, and brocaded purses will also be popular accessories for many brides this year. Bridesmaids' gowns, featuring striking A-line halters, airy ruffled skirts and shorter hemline designs, mirror the 2006 bride's aisle style. 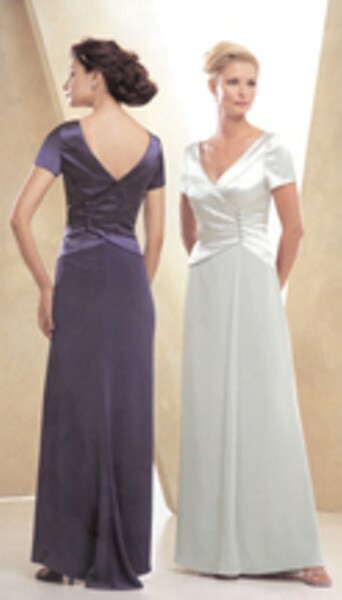 Popular colors for bridesmaids' gowns this season include black, light purple, Tahitian blue, and teal. When it comes to accessorizing bridesmaids, some brides are foregoing matching jewelry for that which is more reflective of each bridesmaid's style and personality. Usually there is a unifying design element among these pieces (color, metals, ornamentation, etc.) that make them perfect for weddings. For example, a friend with an outgoing personality might wear dangly, ornate jeweled earrings, while a more romantic one might wear a delicate necklace that showcases just one of the same gems. Stylish and contemporary, most of these designs can be worn by the bridesmaids after the wedding too.